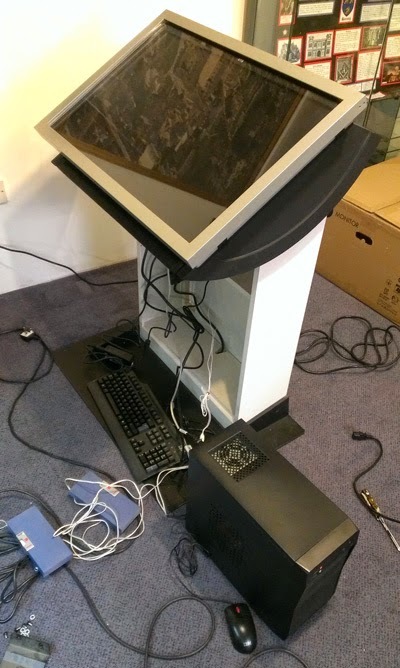 Rebuild of a custom display lectern and installation of a new 30 inch screen. 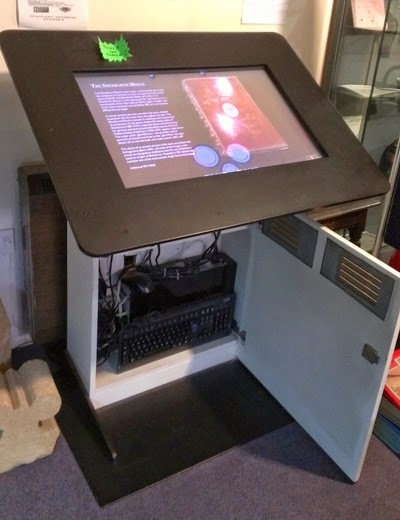 After over 5 years of constant use a large custom built touch screen display lectern used by a local museum had developed flaws in the 30" display. The flaws can be seen as the large circles in the image to the left. Fortunately the lectern was built with a separate touch overlay on top of the main screen and the flaws were in the screen. A screen of this size is already very expensive; a touch screen version of the monitor would have made the repair uneconomic, as the display is vital to the museum. In addition to the display problems the lectern was originally designed with too few ventilation ports resulting in overheating issues and repeated power supply failures. the lectern base. The museum now has a fully refurbished unit that should provide good service for a large number over visitors over the next 5 years. < The rebuild in progress.